Since Tony Gwynn died Monday, many stories have been written about what a great player he was. But among all the mentions of his eight batting titles and 15 All-Star games, there's an extraordinary facet of his game that goes slightly underappreciated even as it's constantly mentioned—his incredible ability to make contact. 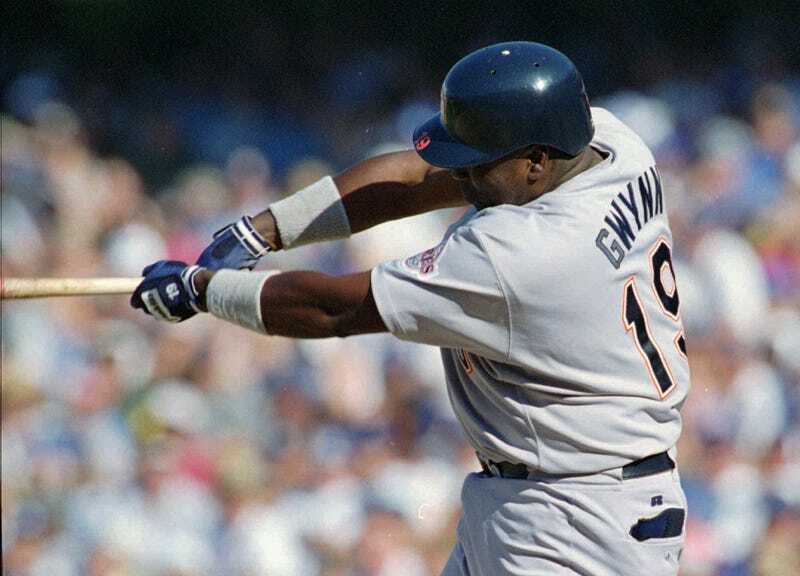 Among all hitters, Gwynn ranks 43rd in strikeout percentage, having struck out in just 4.7 percent of his at bats. But even those numbers do no justice to the great hitter. Among the top 50 strikeout leaders—that is those who struck out least often—Gwynn has no contemporaries. The closest Gwynn has to a peer on the list is Bill Buckner. And Buckner retired in 1990, less than halfway through Gwynn's career. The list is largely dominated by guys who played in the early 1900s. Without adjustments, comparing modern players like Gwynn to guys like Irish Meusel tells you nothing about how impressive their abilities really were since, ballplayers today strikeout about twice as often as they did in the early 20th century. Hitting has greatly evolved throughout the game's history, and that has to be accounted for. I decided to contrast players' strikeout rates against the average strikeout rate from their own era. To do this I adjusted for strikeouts per plate appearance, rather than per at bat, which more accurately measures how often players struck out when they came up to the plate. It also lowers the numbers slightly—for example, Gwynn's strikeout rate shifts from 4.7 percent (per at bat) to 4.2 percent (per plate appearance). I then calculated the average MLB strikeout rate for each season, and computed the strikeout rate during each player's career. For instance, Jo-Jo Moore, who ranks 37th on the list, played from 1930 to 1941 when the strikeout rate ranged from 9.2 percent of plate appearances in 1930 to 10.3 percent in 1941. Averaging the strikeout rate from the collective years of 1930-1941 gives you a rate of 9.6 percent, which tells you that during Moore's career 9.6 percent of plate appearances resulted in Ks. But Moore only struck out 4.2 percent of the time—5.4 percentage points less often than his peers. When looked at through this adjusted lens, Gwynn's strikeouts become incredibly impressive. Gwynn struck out 13.1 percentage points less often than his peers. No other player can claim such a discrepancy. In fact, the difference between the MLB strikeout leader, Joe Sewell, and his peers is only about half as great (7 percentage points). For comparison, Dustin Pedrioa and Alberto Callaspo, two contemporary hitters who are among the very best at avoiding strikeouts—and also have not gone through late-career dropoffs—strikeout on 9.1 and 8.9 percent of their plate appearances, respectively. This translates to improving 11.6 and 11.8 percent on the league average for them. Of course, players during the early 1900s couldn't claim a discrepancy like this since the average strikeout rate was often below 10 percent. But that's not the only reason the top of this adjusted list is dominated by players of later eras. Players of later eras who made this list are self-selected to stand out more among their peers. Only 6 of the 50 players on list started their careers after 1950. A player post-1950 had to fare much, much better than the average player to become a MLB strikeout leader than did a player during the dead ball era. It is sort of reverse chronology of what happened to home runs over time. Just peeking at absolute home runs numbers, Barry Bonds appears king and Alex Rodriguez is fifth. But when you consider players hit more than double the amount of home runs today that they did in the 1930s, it is very likely that Lou Gehrig (who is 27th) would climb ahead of A-Rod on a time-adjusted list. Hitting nearly 500 homers during the 1920s and 1930s is a hell of a lot more impressive than hitting 700 today. Gwynn's numbers show striking out less than 5 percent of the time in the late 1900s is more impressive than striking out 2 percent of the time in the early 1900s—and that he was really been the only player lately to pull off the former. And Gwynn did it all with a small bat. Because it doesn't matter how big your stick is. It only matters how you swing it.